General settings that are common to all components are described below. Component-specific settings are described in the reference pages for each component. Note: Some of these settings do not apply to certain components. In those cases, the fields are automatically disabled. On Show Animation to use when the component is shown.Tip: Choose “Automatic” to use the inverse of the hide animation (if one is set). On Hide Animation to use when the component is hidden.Tip: Choose “Automatic” to use the inverse of the show animation (if one is set). 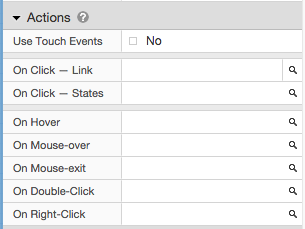 Normally, actions are triggered by mouse clicks, but you can choose to use touch events instead where available. Some components like State Navigation or native elements like select and other form elements do not offer touch events, because those elements already have native behavior for touch events. They will function properly without adding touch event actions. For more information, see Using Touch Events. On Click — Link Page, Asset, or URL to link to when the component is clicked. On Click — States State values to apply when the component is clicked. On Hover State values to apply when the mouse enters the component and remove when the mouse leaves it. This action combines Mouse-over and Mouse-exit behavior. On Mouse-over State values to apply when a mouse moves over a component. This is similar to On Hover, however the states do not automatically revert when the mouse exits the component. On Mouse-exit State values to apply when a mouse exits a component. On Right-Click State values to apply when the component is right-clicked.Tip: Use this to simulate a context menu. Touch actions use touch based events for better mobile support. Some components do not support touch events. These components will work with mobile without any need to configure touch events. Touch actions should work in most desktop browsers as well, using the mouse instead of a touch. Use Touch Events Controls whether the component responds to touch events (rather than mouse events). On Tap — States State values to apply when the component is tapped. On Touch State values to apply when the component is touched. When the touch is released, these states will be removed. On Touch and Hold State values to apply when a component is touched for longer than 1 second. On Any Swipe State values to apply when a finger swipe is detected on this component. On Swipe Left State values to apply when a right to left finger swipe is detected on this component. On Swipe Right State values to apply when a left to right finger swipe is detected on this component. On Swipe Up State values to apply when an upward finger swipe is detected on this component. On Swipe Down State values to apply when a downward finger swipe is detected on this component. Appearance settings are described on the Appearance Settings page. Z Back-to-front position of the component. This overrides the normal stacking order of the component (as shown in the Component Outline). Clear this field to have the position based solely on the stacking order. Width Width of the component. Clear this field to have the width determined automatically based on the component’s content. Height Height of the component. Clear this field to have the height determined automatically based on the component’s content. Fixed Position Whether to use Fixed Position settings or not. Anchor Whether the Fixed Position is anchored to position it is on the design (automatic) or to the top or bottom of the design. 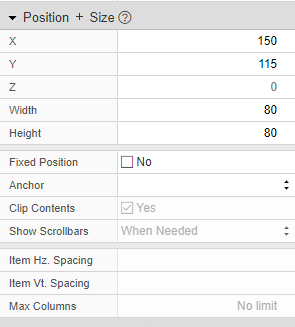 Show Scrollbars Whether to show scrollbars.Choose “Never” if you wish to prevent scrolling of a component’s content, or “Always” if you wish to force scrollbars to appear regardless of the content size. Use specification details to add information about your component to a word export. The Name field is also used in the Component Outline. Name Custom, descriptive name. Appears in the Component Outline and export document. Owner Project member who “owns” the component. The meaning of ownership is up to you and your development process. Status Custom status value. Use whatever is appropriate for your development process. Specify important information about the component, and share your thoughts with other developers. You can choose to include the notes in a Word-document export by selecting the Component Details option when exporting. Use these fields to assist you when using the project Style Sheet. By assigning a unique ID or a class name, you can create style rules that apply to the component. Wrapper #id Component wrapping element CSS ID. Wrapper .class Component wrapping element CSS class names. Separate multiple class names with spaces. Content #id Component content element CSS ID. Content .class Component content element CSS class names. Separate multiple class names with spaces.